July is almost over, and so is our Christmas in July blog hop. We hope you've enjoyed the tutorials these talented designers have shared (if you missed any, you'll find links near the bottom of this post). Because it's never too early to begin a Christmas quilt, we also wanted to share a few free quilt patterns that coordinate with our lines. Below each you'll find a link to download or print the pdf for the pattern--then simply ask for the fabric at your local quilt shop! Find the pattern for "Father Frost's Ornaments" by Jackie Robinson here. Find the pattern for "Wrap It Up" by Tailormade by Design here. 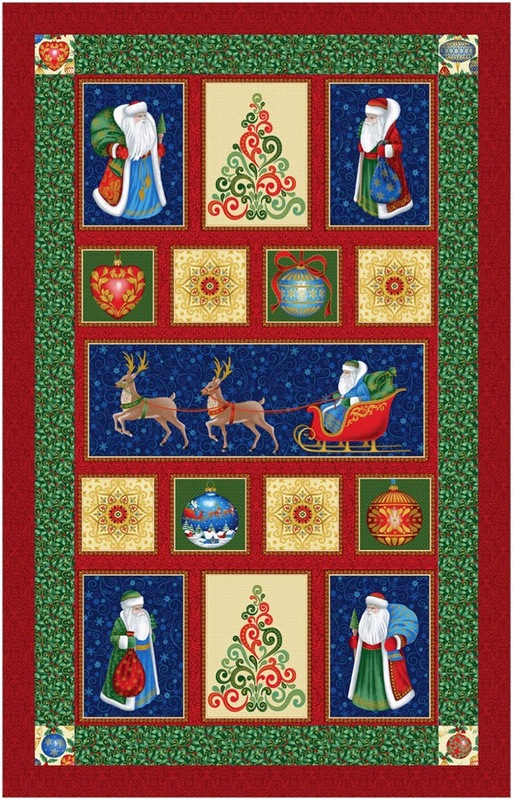 Find the pattern for "Classic Christmas" by Diane Nagle here. If you haven't checked out all of our Christmas in July tutorials, make sure you do! You'll find some fantastic inspiration to help you make some holiday decor before the hustle and bustle of December begins. Fabulous patterns.The first one is My fav! Never tire of Santa. Cute Cute. Beautiful quilts. I really do love the last one with the gold holiday designs. Thank you for putting together the Christmas in July again this year. I always love seeing all these wonderful quilts and projects. Christmas is my favorite holiday.